Poll: Doctors Among Public Option's Biggest Fans A new poll shows that doctors are among the biggest supporters in the United States of a public option in the health care overhaul. One reason: Many say they've had largely good experiences with Medicare. A new poll shows that doctors are among the biggest supporters in the United States of a public option in the health care overhaul. One reason: Many say they've had largely good experiences with Medicare. This is MORNING EDITION from NPR News. Steve Inskeep is on assignment. I'm Renee Montagne. Doctors, by a large majority, support adding a government run health insurance program that would compete with private insurance. That's according to a new survey. What's been called the public option continues to be one of the most contentious issues in the health care debate, but the survey shows that doctors are already used to dealing with government run insurance. JOSEPH SHAPIRO: In the survey, nearly three-quarters of doctors said they favor a public option. Co-author Dr. Salomeh Keyhani is a researcher at Mount Sinai School of Medicine. Dr. SALOMEH KEYHANI (Researcher, Mount Sinai School of Medicine): The results of the study demonstrated that the majority of physicians support a public option in the United States of America. SHAPIRO: That included the 63 percent who say they'd like to see patients get a choice of public or private insurance and another 10 percent who favor a public option only. They'd like to see a single-payer system. When the public in general is surveyed, support for a public option has run between 50 and 70 percent. Co-author Dr. Alex Federman - he is also at Mount Sinai - says it shouldn't be a surprise that doctors favor a public option in numbers even greater than Americans in general. Dr. ALEX FEDERMAN (Researcher, Mount Sinai School of Medicine): Probably the most important reason is grounded in physicians' experience with Medicare. SHAPIRO: Doctors already have lots of experience with that government-run health insurance. The survey also asked the more than 2,100 doctors about how they compared Medicare with private insurance. Dr. FEDERMAN: Physicians favored Medicare when it came to delivering care to patients. They thought Medicare was better when it came to autonomy and their decision making and their ability to get patients the care that they thought the patients needed. SHAPIRO: There was plenty that doctors said they don't like about Medicare. They said private insurance was better in terms of reducing paperwork, how much they got paid and how quickly. Dr. Varshasb Broumand, a Texas nephrologists, has seen some of his kidney transplant patients deal with one of the biggest absurdities in Medicare. The government program will pay for a patient's expensive kidney transplant, but it won't keep paying for the drugs a patient needs to keep their body from rejecting the transplant. Dr. VARSHASB BROUMAND (Nephrologist): After three years, they're out of luck because Medicare will stop paying for their medications. SHAPIRO: Twenty-seven percent of doctors in the survey said they support private insurance only. They don't trust government to get it right. But Broumand, despite his problems with Medicare, isn't one of them. He supports a public option. Dr. BROUMAND: If you have choices and options, you find the plan that best suits you. It provides healthy competition to lower costs and hopefully provide more efficient and better services. SHAPIRO: Lots of the doctors in the survey said that they sometimes run into problems with Medicare. But Keyhani, who's spoken publicly in support of a public option, says doctors she spoke to for the survey often worry more about their uninsured patients. Dr. KEYHANI: So many of Americans are uninsured and physicians have to take care of uninsured patients. A public option would sort of help guarantee that most people had coverage. And I think that's very important to physicians who wake up in the middle of the night, they go to the hospital and they take care of patients and are not reimbursed. So having a guarantee of reimbursement of some sort I think is very appealing to most physicians. SHAPIRO: The new survey was published online by The New England Journal of Medicine and funded by the Robert Wood Johnson Foundation, a health care organization that favors health reform. MONTAGNE: And we should note that the Robert Wood Johnson Foundation also supports NPR. The survey was designed and conducted by Drs. Salomeh Keyhani and Alex Federman of Mount Sinai School of Medicine. Over the summer of 2009, they surveyed a random sample of more than 2,000 physicians. Among all the players in the health care debate, doctors may be the least understood about where they stand on some of the key issues around changing the health care system. Now, a new survey finds some surprising results: A large majority of doctors say there should be a public option. When polled, "nearly three-quarters of physicians supported some form of a public option, either alone or in combination with private insurance options," says Dr. Salomeh Keyhani. She and Dr. Alex Federman, both internists and researchers at Mount Sinai School of Medicine in New York, conducted a random survey, by mail and by phone, of 2,130 doctors. They surveyed them from June right up to early September. Most doctors — 63 percent — say they favor giving patients a choice that would include both public and private insurance. That's the position of President Obama and of many congressional Democrats. In addition, another 10 percent of doctors say they favor a public option only; they'd like to see a single-payer health care system. Together, the two groups add up to 73 percent. When the American public is polled, anywhere from 50 to 70 percent favor a public option. So that means that when compared to their patients, doctors are bigger supporters of a public option. The researchers say they found strong support for a public option among all categories of doctors. "We even saw that support being the same whether physicians lived in rural areas or metropolitan areas," says Federman. "Whether they lived in southern regions of the United States or traditionally liberal parts of the country," says Keyhani, "we found that physicians, regardless — whether they were salaried or they were practice owners, regardless of whether they were specialists or primary care providers, regardless of where they lived — the support for the public option was broad and widespread." 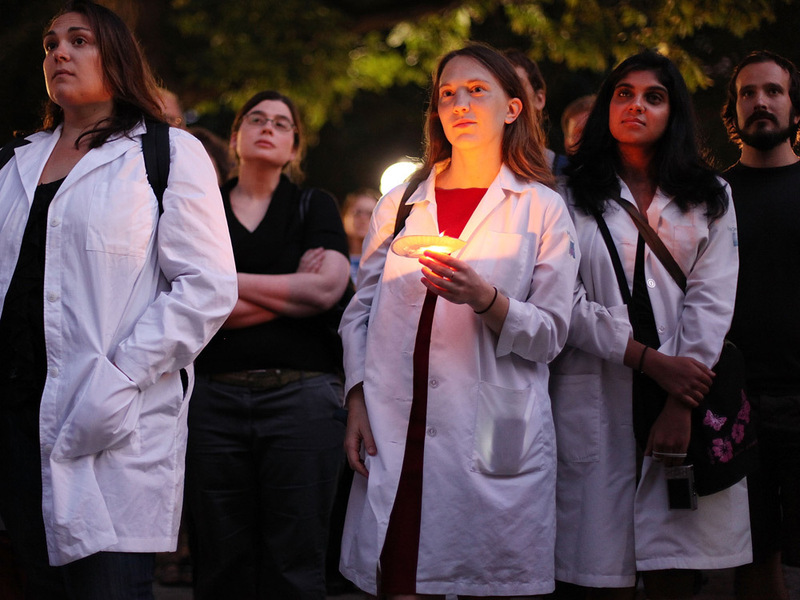 Doctors and other supporters of health care overhaul attend a candlelight vigil in New York City in September 2009. The gathering was one of hundreds nationwide honoring those suffering under the current health care system. Keyhani says doctors already have experience with government-run health care, with Medicare. And she says the survey shows that, overall, they like it. "We've heard a lot about how the government is standing in between patients and their physician," Keyhani says. "And what we can see is that physicians support Medicare. So I think physicians have sort of signaled that a public option that's similar in design to Medicare would be a good way of ensuring patients get the care that they need." The survey was published online Monday by the New England Journal of Medicine. It was funded by the Robert Wood Johnson Foundation, a health care research organization that favors health reform. The survey even found widespread support for a public option among doctors who are members of the American Medical Association, a group that's opposed to it. The AMA fears a public option eventually could lead to government putting more limits on doctors' fees. "The American Medical Association has traditionally been probably the loudest voice for physicians across the United States," says Federman. "And part of our reason for doing this research was really to get at the real voice of physicians as opposed to the voice of one physician organization." Keyhani and Federman belong to another, smaller group, the National Physicians Alliance. It supports a public option, and Keyhani has spoken publicly about her own support for a public option. What Would A Public Option Look Like? It's hard to know for sure what doctors mean when they speak about a public option, says Dr. James Rohack, president of the AMA. "Because when I say public option, or you say public option, it means different things to different people, kind of like the Rorschach ink blot test — when you look at it, to some people it means one thing, to other people it means the other thing." Politicians in Washington turn to the AMA for support and guidance, even though fewer than a third of practicing doctors belong to the lobbying group. The AMA's own position on a health overhaul has, at times, been hard to pinpoint. In July, it praised the bill that came out of the House of Representatives. That bill included a public option. But the AMA made it clear that what it really liked was that it eliminated cuts in doctors' fees from Medicare. "And so I think that's why we need to be very clear about what does the AMA articulate for," says Rohack. "It's to make sure that everyone has coverage that's affordable, that's portable and that is quality — that is, it covers the things you need to cover because you've got a medical condition or developed a medical illness."